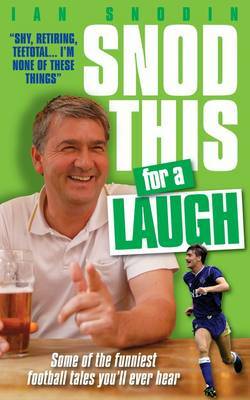 Guaranteed to be one of the funniest football books of the year,'Snod This For A Laugh' is a publication with a difference. Former footballer Ian Snodin offers a unique insight about life on and off the pitch during an 18-year playing career which saw the first influx of SKY money and the FA Premier League. Revelations are laid bare in this series of 'pub chat' discussions on a range of topics - as well as the sport he made his name in. Some of British sports' most high-profile names feature, including Shearer, Gascoigne, Beardsley, Bremner, Southall, Ruddock. We delve into the footballing memories of a man who signed for Everton ahead of then double winners Liverpool; who captained his home-town club while still a teenager; whose mentor was Leeds United legend, Billy Bremner; who was robbed of a potential place in England's 1990World Cup side due to a succession of serious injuries. Ian also recalls his foray into football management back at his beloved Doncaster - a club on their knees, newly relegated from the Football League when he agreed to take over only weeks before the start of the 1998/99 season. From scrabbling round for kit and struggling to field 11 men early in his managerial stint, he guided Rovers to cup success and league stability. Still heavily involved in the media, Ian remains a popular figure particularly on Merseyside and in his native Yorkshire, and is also a successful after-dinner speaker.